Brussels, 2 February 2017: Today, on Nano World Cancer Day 2017, the European Technology Platform on Nanomedicine (ETPN) organised a press conference in 15 countries simultaneously. In Belgium, Flanders Innovation & Entrepreneurship took the initiative, together with VITO, to give Flanders’ top specialists in cancer detection and treatment using nanotechnology the opportunity to inform the press on the current status. Cancer remains the leading cause of death worldwide, with 8.2 million related deaths and 4 million new patients on an annual basis. Nanomedicine has the potential to achieve breakthrough innovations to diagnose and treat cancer. Moreover, Belgium is very active in this domain, with 58 hospitals, research organisations (including VITO) and companies (see www.etp-nanomedicine.eu/public/european-nanomedicine-map). A lot of medicines, in particular medicines for cancer treatment, can have numerous side effects. In order to reduce these, the (existing) chemotherapeutics have to be transferred to cancer cells in the body as specific as possible. Therefore, they are captured in nanoscopic particles (nanomedicine) that can detect the cancer tissue in an intelligent way. A dozen of such ‘cancer nanomedicines’ is already being used on cancer patients in Europe, the United States and a few Asian countries. Nevertheless, major challenges in the rigorously topical administration of these ‘old’ chemotherapeutic medicines still exist. The top researchers expect that nanomedicine will particularly play a crucial in the administration of ‘modern’ (expensive) biotechnological (cancer)medicines, whose ‘target’ is often not situated on the surface of the cancer cells, but in the cell (intracellular). Nanomedicine will have to protect biotechnological medicines from degradation in the blood and navigate them through cell membranes. In order to initiate a breakthrough for nanomedicines as therapeutics, fundamental research into the behaviour of these nanoscopic particles in a biological environment must continue. Many questions remain largely unanswered, such as (i) the distribution of nanoscopic particles after injection into the body, (ii) the behaviour of nanoparticles in body fluids (e.g. blood …), (iii) the interactions between nanoparticles and cells and (iv) the toxicity of such materials. In addition, the ability to reproduce nanomedicines on a large scale remains a major challenge. Extracellular vesicles (EVs) are small vesicles with nanodimensions that are secreted in our body fluids by both healthy and diseased cells. They contain different molecules, originating from the secreting cell. If tumor cells are present in a body, these small vesicles provide an enormous diagnostic potential thanks to their molecular content. They could eventually contribute to a non-invasive and early detection of cancer, even in preventive screening campaigns. The current research focuses on the isolation and characterisation of the vesicles, with a view to biomarker studies. 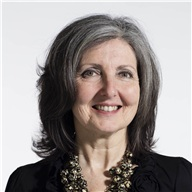 Biomarker studies actively search for molecules that are specific (a marker) for a given type of cancer, and can confirm or rule out the presence of that cancer. 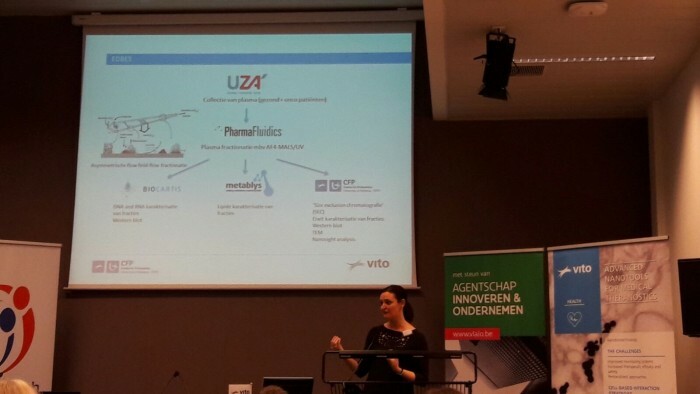 VITO, the Antwerp University Hospital (UZA) and a couple of companies such as Biocartis (Mechelen), Pharmafluidics (spin-off of VUB) and the R.I.C. (Kortrijk) are working on the isolation of EVs from liquid biopsies (blood, urine …). Once the vesicles are sufficiently pure, the researchers can perform protein analyses to identify e.g. biomarkers for bladder cancer. The romans already used very small particles, the size of a millionth of a millimeter (nanoscale) of precious metals such as gold and silver in their glassware. But it was not until the 20th century science could explain the color properties of these nanoparticles. Since then, other properties of this nanomaterial were discovered and several of them found their way into specific applications. One of the most prominent applications today is the control of tumors. The use of a combination of the carefully chosen gold nanostructures with a coating consisting of tumor-specific biomarkers makes radiotherapy more effective. Furthermore, this nanomaterial can also be used for imaging of the tumor and as a reinforcement of chemotherapy. However, this research is still almost exclusively taking place in research centres and academic laboratories. Phoreon is an SME, located at the bio-incubator in Leuven. The company produces high-quality gold nanomaterials for applications in medicine and for the pharmaceutical industry. The Nano4Helath(N4H) project is a cross-cluster approach of the Flemish government to address the challenges in the health care system that require a combination and an innovative application of top technologies such as biotechnology and nano-electronics. On the basis of specific healthcare challenges, N4H focuses on developing a cross–cluster ecosystem and increasing the (technology, market and operational) readiness of specific solutions through multidisciplinary collaboration in co-creation with the user.